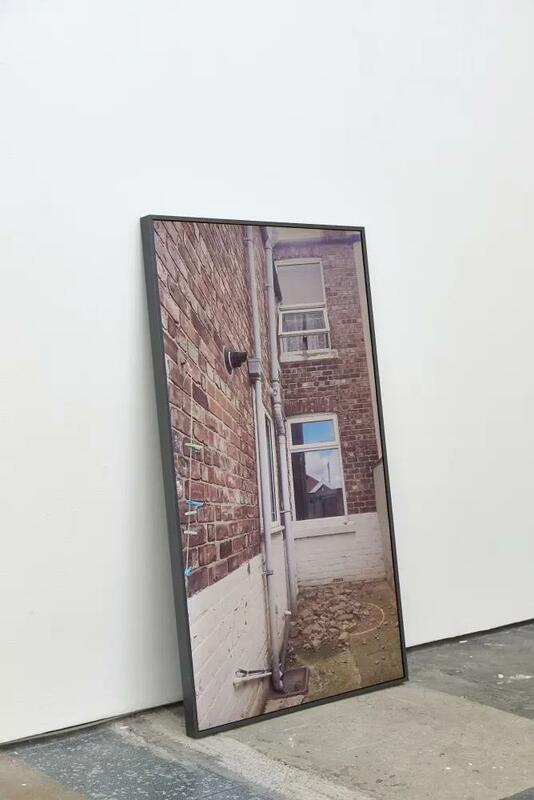 In her video ‘No Equivalent’ (2018) Emily Hesse shows a brick being thrown from the upper window of the back window of a common terraced house. The short looping nature of the action as the brick drops to the ground recalls the short archive film clips of early performance and video art often found in museum survey shows and could even be a parody of Richard Serra’s ‘Hand Catching Lead’ (1969). 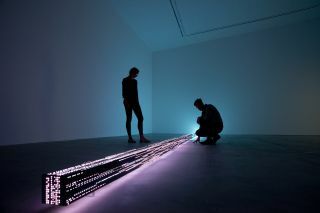 The monitor showing ‘No Equivalent’ leans upright in a portrait format against the wall in a manner that spoofs Serra and the Minimalist cannon. The work is a pointed reference to Carl Andre, whose ‘Equivalent VIII’ Hesse remade for a recent show at MIMA. The bricks from this work were used for ‘No Equivalent’. The work returns us to Andre’s role in the death of his wife Ana Mendieta, killed by a fall from a first floor window in 1985, reportedly after an argument about the lack of equal status for women artists in the art world. The subject of inequality and especially the hypocrisy of a public sphere including the art world that condones misogynist and discriminatory acts – Andre’s 2017 retrospective in Los Angeles was picketed by womens’ rights groups – is exposed by Hesse in this excellent show. 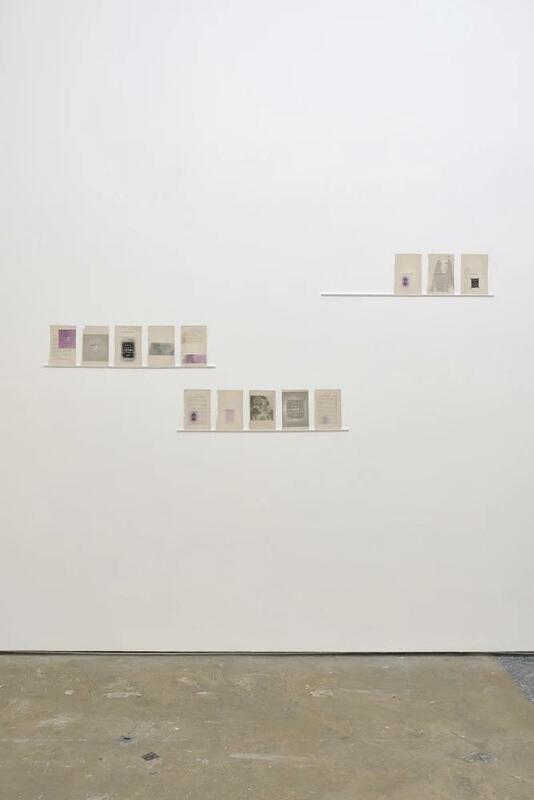 Next to ‘No Equivalent’ are pages from a 19th Century book on the instruction of correct behaviour in young women modified by Hesse, that together with the allusion to the Mendieta story provides an eloquent commentary on the varied violence used to ‘put women in their place’. The artist’s tactic is to insert herself within the mostly male and privileged historiographies of contemporary art. ‘The Centre of Things (2018) places in the middle of the gallery a thread from which hangs a needle apparently given to Hesse by Jannis Kounellis for giving him a lift to the airport while working on a show in Middlesbrough. 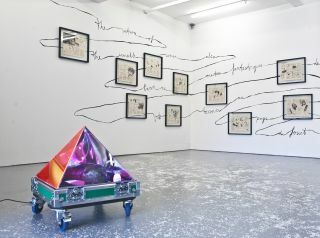 This creates a piece of instant folklore about the piece, presenting the troubling idea that the work achieves additional value solely because of its connection to a cannonical male artist. 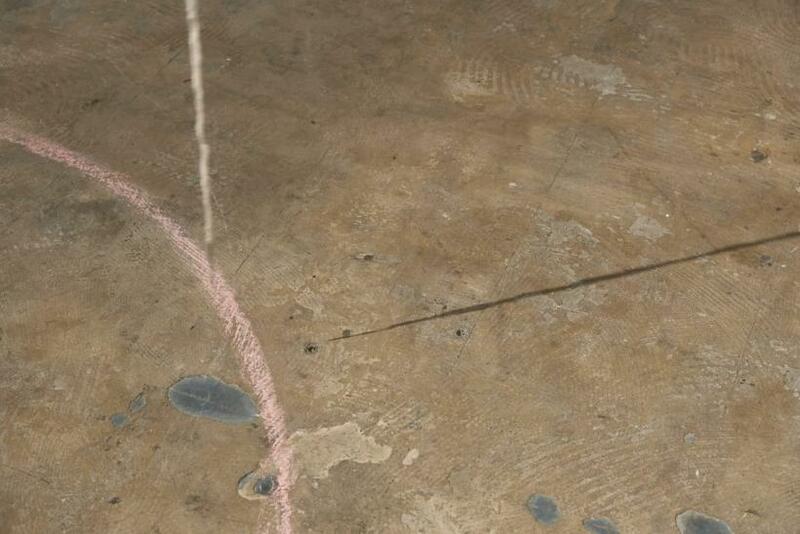 Hesse’s questioning of her own proximity to the notional centre of the art is illustrated by the circle drawn on the gallery floor that the pin hangs above - is she inside or outside the circuit of acceptance? The artist can be heard reading from her book ‘Black Birds Born from Invisible Stars’ which details touchingly her frequently disenchanting encounters with art institutions. 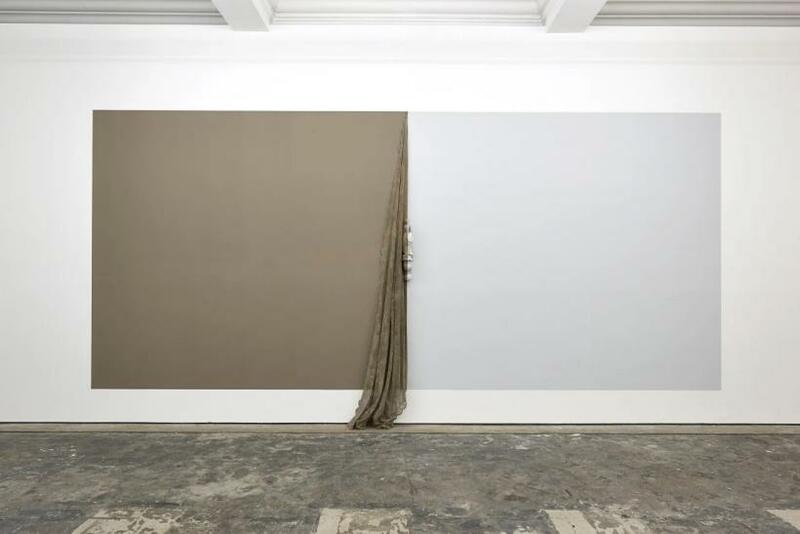 ‘The Centre of Things’ suggests the paradox that the institutional reification of art practices such as Kounellis’ that originally aimed to be rooted in common materials turns them into sacred objects dislocated from contemporary life. 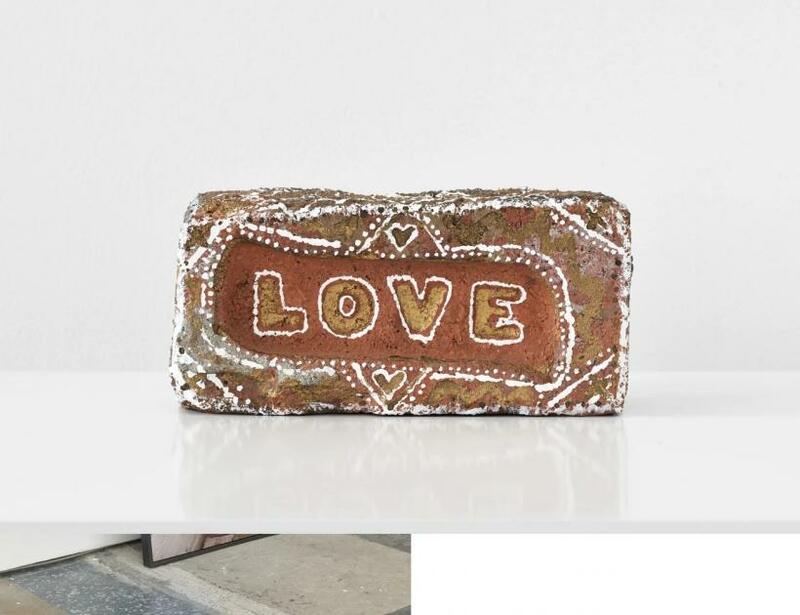 So it is that Hesse displays her manufactured relics on a shelf including a house brick coated in gold leaf in ‘Enduring (The Ghosts in the Room)’ (2018), as though these quotidian objects provide a focus for a ritual of connecting with a fading family history in Teeside. 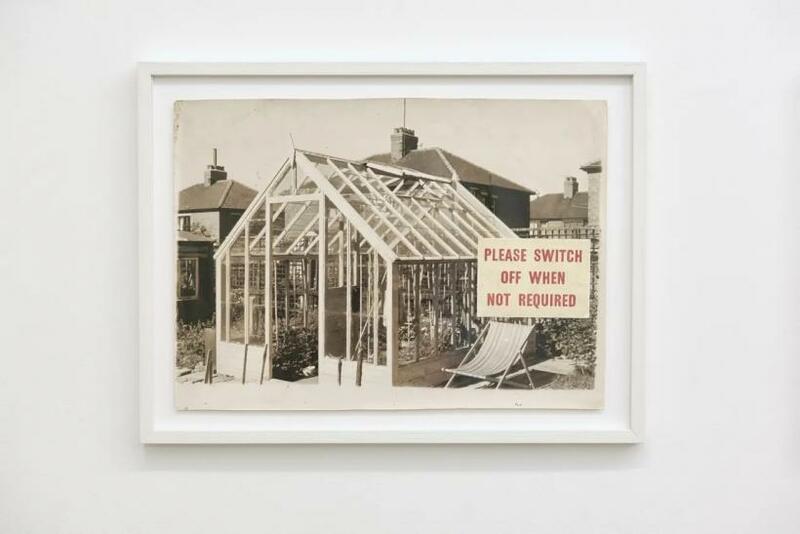 A sequence of three found archive images called ‘The Shedding’ show garden sheds and outside toilets representing lifestyle aspirations of the past that Hesse overlays with strange doodles and warnings suggesting there are further family traumas behind the scenes. 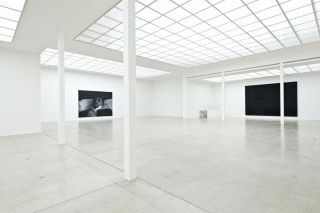 Throughout the show Hesse’s critical attitude cuts against the tendency to appeal to an easy regional nostalgia while courageously addressing contemporary injustices.